So you’ve decided to join Twitter. Using Twitter for your business can build brand awareness and engage with your target audience. 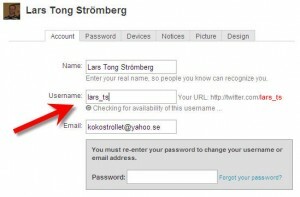 When you register you will need to create a handle name or user name. This is the most important step of the process because it’s how people will find you on Twitter. When creating your handle you need to keep some things in mind. The Twitter user name should be as short as possible. If you have a long user name and someone wants to send you a reply they will use a lot of their limited space (140 characters) on your name. When creating a Twitter account a second name is used called your real name. If you’re a business owner and want to promote yourself directly or your name is associated with the business or brand it can be very effective because most people want to a make a connection with a real person. Use your real name if it’s for a personal account. Use your business brand if it’s for a company. How will you brand your company? What kind of messaging or updates will you be posting? Develop your personality as you post. Thank people who retweet you. If you do not want people to know who you are you can use an alias. However, you lose the intimacy and connection with your followers. It will also be difficult for others find you or business. Twitter is an excellent marketing tool and can build brand recognition but you need to know how to take full advantage of it. The book, Twitter Marketing: An Hour a Day, is a great guide to a successful marketing campaign. Always remember your user name is not permanent. You can change your user name at any time in your Settings. Please keep in mind that your followers will not be notified about the change. If you do change your user name I suggest making a new Twitter account using the old name. Leave a tweet on the new account informing everyone that you have changed your user name. This entry was posted in Fun, SEM, SEO, SMM, Web Development, ZD White Wall and tagged handle, optimization, SMM, social media, twitter, twitter handle, twitter marketing, username.